Optimise your body’s natural functions with the KIKI Health Alkalising Bundle, a trio of dietary supplements that support the digestive system, strengthen bones and encourage a rebalancing of the body’s processes. A 100% raw, alkalising whole food supplement that supports daily nutritional needs and helps promote good digestive health. Utilising only high quality, ethically processed raw plant-based foods, micro-algaes, enzymes and bacterial cultures, the supplement helps the body to absorb essential nutrients for healthier digestion and general nutritional support. The 32, cold-pressed primary ingredients have been carefully selected to ensure maximum absorption and implementation in the body at a cellular level. Add to juice or water, or sprinkle or mix into food. Boost your wellbeing with a refined food supplement high in iron, fibre, vitamins and protein. Carefully cultured and harvested from filtered, freshwater ponds, each tablet contains 100% raw Chorella Powder that has been extracted from deep below the ground at low temperature with cracked cell walls to ensure optimal digestion of the beneficial properties within each Chlorella cell. Vitamins B12 and E contribute to the normal functioning of the nervous system and metabolism while protecting cells from oxidative stress. Iron supports normal cognitive function and helps combat fatigue, plus protein enhances muscle mass growth and helps the maintenance of normal bone structure. Free from gluten, dairy, wheat, preservatives, synthetics, sweeteners, artificial colours, binders and fillers. Help the body regain its natural balance with an effective health supplement that encourages improvements in health, skin, teeth and bones. If the stomach has been subjected to a poor diet or stress it often becomes too acidic. 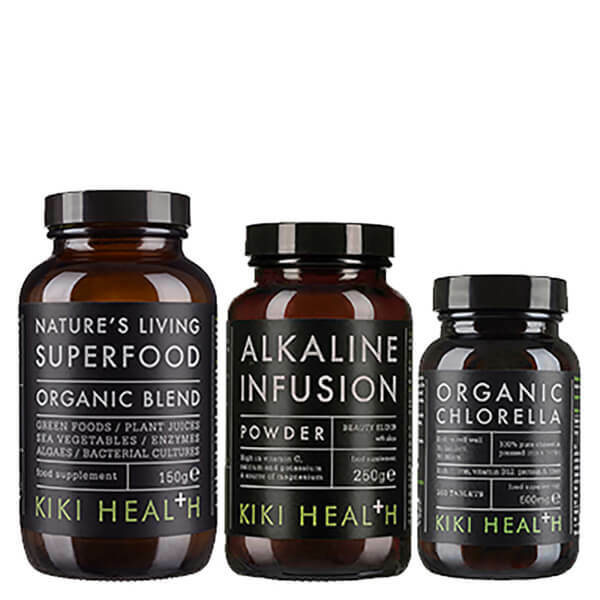 KIKI Health Alkaline Infusion seeks to neutralise the acid with alkaline minerals; helping to regain a natural and healthy balance. Enriched with Silica, the powder encourages collagen production, which helps to keep skin visibly firm and youthful, as well as promoting healthy hair and nail growth. The powder is also an effective source of Vitamin C, Calcium, Potassium and Magnesium, which ensure the body is functioning well. The powder formula is sweet to the taste and can be mixed effortlessly into water, juice or smoothies. Boasting a fruity flavour that combines citrus with sherbet, the Alkaline Infusion Powder acts as a sweet treat that the body is able to benefit from. Superfood: Adults intake should begin with ½ teaspoon daily and gradually increase to 1 or more heaped teaspoons according to your lifestyle. Can be consumed mixed with juice or pure water. Alternatively, it can be sprinkled or mixed with food. Packed in amber glass for optimum nutritional preservation, freshness and purity. Chlorella: Adult intake – six to ten (6-10) tablets per day. Alkaline Infusion: Mix 2 teaspoons in water or juice. Try mixing into green powdered smoothies or juices to sweeten and add an extra zing. Superfood: Nettle Leaf, Wheat Grass, Barley Grass, Horsetail, Alfalfa Grass Juice, Carob, Burdock Root, Ginger Root, Nopal Cactus, Barley Grass Juice, Wheat Grass Juice, Oat Grass Juice, Dandelion Leaf, Parsley Leaf, Kale, Broccoli, Cabbage, Alma Fruit, Spirulina, Chlorella (Broken Cell Wall), Kelp, Fucus Vesiculosus, Lipase*, Cellulase*, Protease*, Amylase*, Bromelain*, Papain*, Lactobacillus Acidophilus*, Bifidobacterium Breve*, Bifidobacterium Infantis*, Bifidobacterium Longum*. Chlorella: Organic Chlorella (500mg per tablet). Alkaline Infusion: Lemon-Juice Powder, Inulin (34%), Potassium Citrate, Calcium Citrate, Magnesium Citrate, Natural Aroma, Vitamin C, Bamboo Powder and Acerola Cherry Powder.